Green Land estate lies on the road between Pyin Oo Lwin and Mogok, near the border of Mandalay Division and Northern Shan State. This is a family business led by Mr.Sai Wan Maing. Mr. Sai Wan has childhood memories of seeing coffee farms along the road near Pyin Oo Lwin each time his parents took him from Yangon to visit family in Northern Shan. Now he runs one of the largest arabica plantations in the country (about 450 acres), and has won awards over multiple years of Myanmar's national quality competitions. He operates the estate together with his uncle and aunt, along with two local agronomists and many local workers. On the estate you can see various experiments with different spacing, shade tree species, fertilisation, and irrigation rates. U Sai Wan is currently one of fewer than 20 certified Q Arabica Graders in the country. 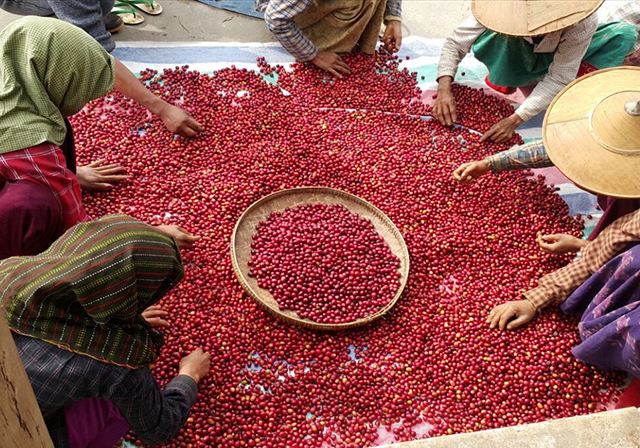 For honey coffees, Green Land pulps fresh cherry before spreading it to dry on raised beds, with no demucilagination. Parchment is turned carefully every hour for 7-10 days, it's then hulled, sized, and sorted at the Mandalay Coffee Group Pinhalense dry mill.